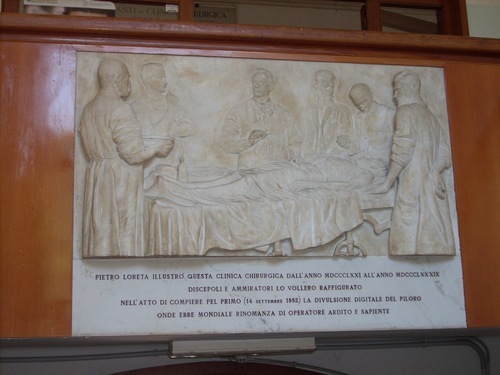 This marble bas-relief of Pietro Loreta performing the first digital pyloric divulsion on September 14, 18821, can be seen on the central staircase of the Surgical Pavilion in the Policlinico Sant'Orsola-Malpighi in Bologna. Beneath the bas-relief the following italian inscription can be read: "PIETRO LORETA ILLUSTRO' QUESTA CLINICA CHIRURGICA DALL'ANNO MDCCCLXXI ALL'ANNO MDCCCLXXXIX / DISCEPOLI E AMMIRATORI LO VOLLERO RAFFIGURATO / NELL'ATTO DI COMPIERE PEL PRIMO (14 SETTEMBRE 1882) LA DIVULSIONE DIGITALE DEL PILORO / ONDE EBBE MONDIALE RINOMANZA DI OPERATORE ARDITO E SAPIENTE". 1. See L.Manara (ed. ), Surgical Instruments of The University of Bologna Surgical School, Policlinico S.Orsola-Malpighi, Bologna s.d., p. 27.